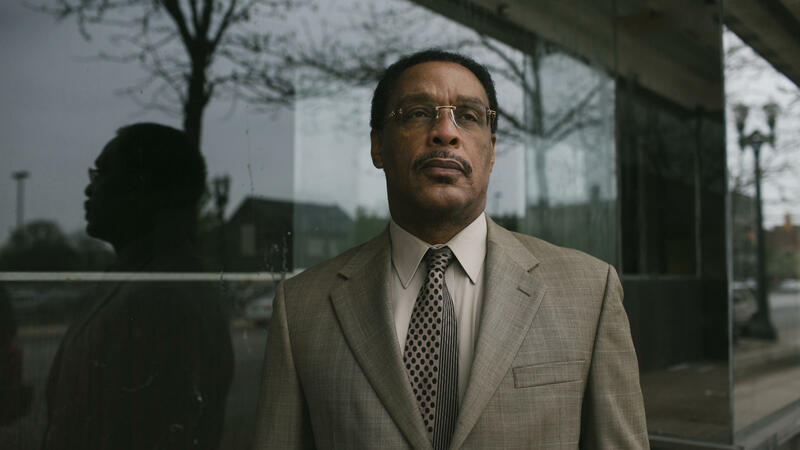 Chuck Hughes, executive director of the Gary Chamber of Commerce stands on Broadway Street in front of one of many empty storefronts in downtown Gary. The largely empty parking lot of the Majestic Star Hotel in Gary. The former Trump property was sold in 2005. Auto worker Ted Kenworthy in front of the Chrysler plant last Wednesday in Kokomo. During a 2010 visit to Kokomo, President Obama said the auto bailout greatly benefited the city. The Gary Works Steel Mill looms against a cloudy sky Wednesday, April 27, 2016 in Gary, Indiana. 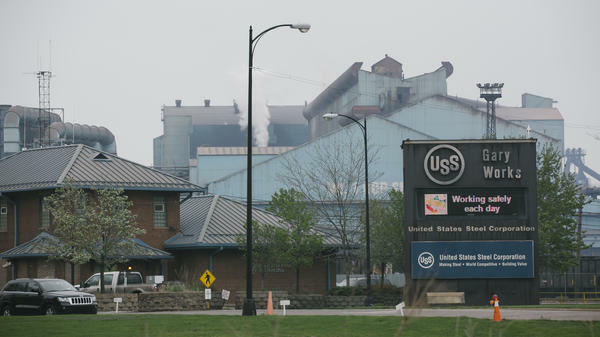 U.S. Steel closed the coke plant in May of last year. An abandoned building on Washington Street in downtown Gary, Ind. Once a booming steel town, Gary's population has dropped sharply, resulting in abandonment and decay. Left: The decrepit Mina's Furniture Co. on Broadway Street in downtown Gary. 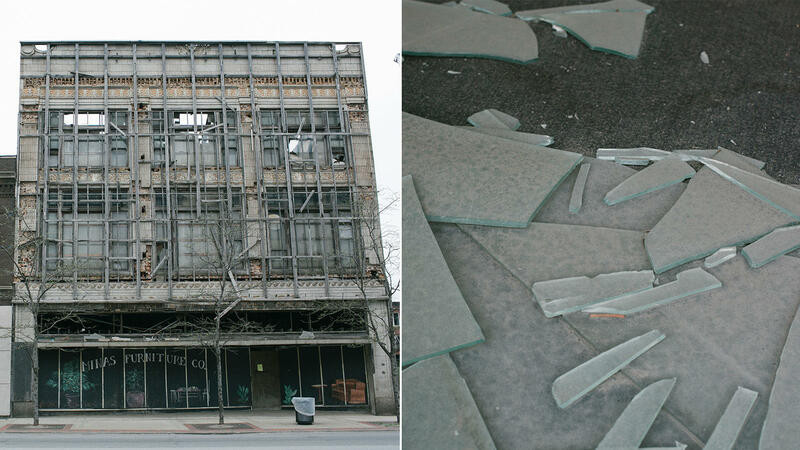 Right: Glass shards in a broken storefront window on Broadway in downtown Gary, Indiana. 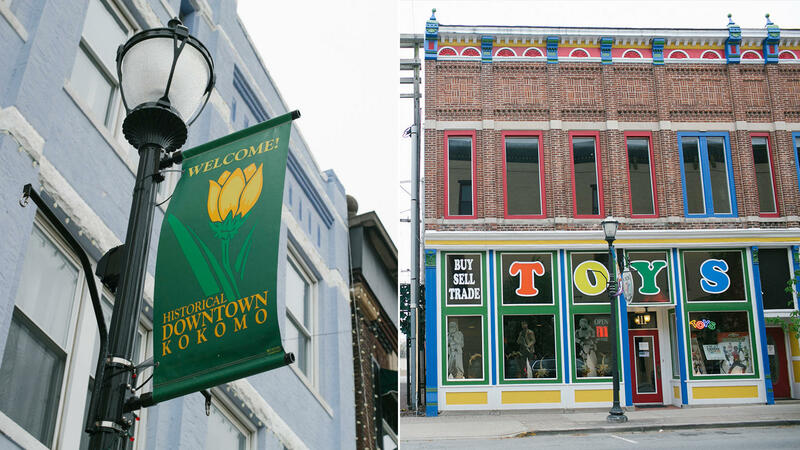 Left: A sign in downtown Kokomo and Right: Kokomo Toys & Collectibles on Sycamore Street in Kokomo. Indiana is the country's leading manufacturing state per capita — more than 17 percent of Hoosiers work in the industry. And despite recent global trends, manufacturing remains a major influence in the state's economy — as well as its presidential politics. Gary, Ind. is a city built by U.S. steel on the south shore of Lake Michigan. In the 1970s, tens of thousands of people worked in the mills. "You know, all you really needed was a strong back and do what you're told," said Sam Woods, who has worked in the mills for more than 40 years. "Jobs were so plentiful, if you got fired from one steel mill, you can go and put an application and get started working the next week at another steel mill in northwest Indiana." 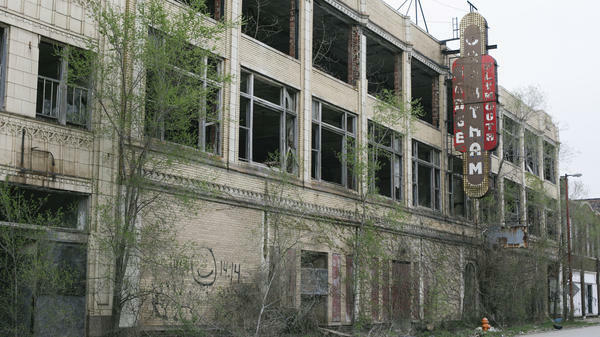 But, like other steel cities, Gary got rusty — jobs were lost, buildings abandoned. Then in the '90s a New York businessman came to this predominantly African-American town and promised a new future. "At the time, everybody was excited, man, it was the rumblings — 'Trump's coming. Donald Trump!'" said Chuck Hughes, who was a city councilman when Trump got a license to build a casino in Gary. "I met him ... and, I was excited, like everybody else." Gary was desperate, crime was high and jobs were scarce. "Trump promised that he'd build the tallest, greatest hotel. I heard him say this out of his own mouth," said Hughes, who now works for the Gary Chamber of Commerce. But, as Hughes looks out on Buffington Harbor — where the 37,000 square-foot Trump casino boat once docked — he says Trump was full of bluster. "It's not Trump Tower, it's not Trump Taj Mahal that he promised," Hughes said, pointing to the former Trump hotel, which looks more like a motel — a drab shade of tan with boxy windows, no gilded walls or crystal chandeliers. (The casino and hotel are now owned by Majestic Star). "(Trump) didn't stick around long enough to make an impact in the community, he left," Hughes said. "He left," he repeats with a laugh and tinge of disappointment. Trump owned the casino in Gary for about a decade, opening it in 1996 and selling it in 2005. But, that was not his only local investment. He brought the Miss USA pageant to Gary twice, in 2001 and 2002. These days, gaming is one of the major employers in the area, but for Trump and his early investments, there are no fond memories. Most people in the city don't think Trump's investments paid off. The current mayor, a Hillary Clinton surrogate, says Trump's investments taught them a lesson about the businessman-turned-candidate. "He's gotten in, pulled as much equity as he can out of a project, and gone on to the next thing," said Gary Mayor Karen Freeman-Wilson. "You have to have a long attention span if you're the president, I just don't think he has it." These days, Gary is still struggling economically. The famous Memorial Auditorium where Frank Sinatra once sang has weeds growing out of it. There are thousands of abandoned buildings with boarded up windows all over town. The official unemployment rate is 7.5 percent, but the mayor estimates it's closer to 45 percent if you account for all the people who've given up looking for work. Those once ubiquitous middle class steel mill jobs are disappearing — fewer people work in the mills because of both globalization and machine modernization. Woods is one of the lucky ones who still has a job in a Gary mill, and he's a long-time a Democrat. "Bill Clinton was one of the best presidents we've ever had," said Woods. "But, he sucker punched us. The worst thing he did was - he pushed NAFTA." Woods thinks Hillary Clinton will also try to push through trade deals like TPP that will hurt manufacturing. So Woods plans to vote for Bernie Sanders. For similar reasons, in Tuesday's Republican primary, Trump — who courts white working class voters and often speaks about global trade as a detriment to American manufacturing — is expected to perform well in this corner of the state. But, overall, Gary, and Lake County more broadly, is solidly Democratic turf. President Obama won the the area by more than 30 percentage points in 2012. 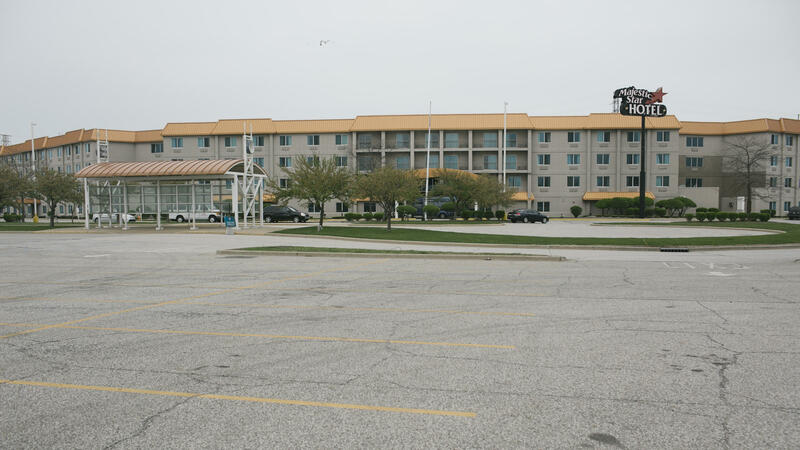 Did Obama's auto bailout help Kokomo bounce back? Drive about two hours southeast, and you'll find another manufacturing hub — Kokomo has a very different political history and economic fortune. Whereas Gary has suffered from a steady economic decline, Kokomo's economic collapse (and subsequent resurgence) has been more severe. The auto bailout — first initiated by George W. Bush and then pushed through by President Obama — had a direct impact here. Chrysler has three massive transmission plants in the area that collectively manufactures more transmissions than any other domestic factory the company owns. Thousands of people work in Kokomo's Chrysler facilities. But, the city got hammered during the recession. There was a point in June 2009 when unemployment hit 20.2 percent. "I just remember when I got notified that I got let go, 800 people were let go the same day," said Randy Rusch, an engineer who used to work for the auto electronics company Delco. "There were a bunch of people meeting right here," Rusch said over bites of beef brisket at a popular local brewery. "So that whole bar section was full of people, all of whom were leaving Delco." People in Kokomo say the city felt like a ghost town — the mall was empty, small businesses shuttered, houses foreclosed and some families even left town. But, then in 2008 and 2009, the federal government intervened with the auto bailout. It rescued Chrysler and GM — two major employers here. And, the unemployment rate last year fell below 5 percent. These days, in and around Kokomo, Chrysler employs about double the number of employees it had in 2009, according to a company spokesman. And, plenty of people, particularly Democrats, credit the Obama administration for rescuing the city. They say Kokomo would have suffered from a 1930s-style depression if it weren't for the auto bailout. And, when the city's Democratic mayor endorsed Clinton he explicitly praised her support of the auto bailout. But, not everyone feels that way. Many people say Kokomo got itself out of the gutter through the hard work of local politicians, strong community organizations, and vibrant civic institutions. Even Rusch, who lost his job in the car industry, feels conflicted about the bailout. "I see the negatives here, I see some positives here," he said. Rusch's pension got cut, and he blames the Obama administration for not handling the situation correctly. Rusch leans Republican and plans to vote for Ted Cruz in the Indiana primary. And, he's not unusual. Kokomo is in Howard County, a consistently red section of the state in presidential elections. Despite the auto industry's recovery — in the last election, Obama lost Howard County by about 14 points (56 percent Romney to 41.7 percent Obama), partly because of men like Ted Kenworthy, a lapsed Democrat, who supported Romney. "A lot of guys when they hear me say this, I really catch a lot of flack. They want to say 'well, if it wasn't for Obama, we wouldn't have a job.' And, I go, 'bull.' That is not. I don't believe that," said Kenworthy, a union employee at Chrysler. Kenworthy thinks Chrysler would have survived without help from Washington. "We would have been better off had they let us go through the regular process of bankruptcy and come back and build our company back up instead of the government coming in and bailing us out," he said. Kenworthy plans to vote in the Indiana primary Tuesday, though he's still undecided about which candidate he'll choose. But, he knows for sure - whom he will not vote for. "I will not vote for Hillary," he said. "I think she could probably be the worst thing this country's ever seen." Kenworthy voted for Bill Clinton in the '90s, but he says Hillary Clinton scares him. And he wants a Republican in the White House. "She's too much of a liberal," he said. "Put people to work, quit giving people everything." And, so even though Hillary Clinton is the candidate running on President Obama's record and the legacy of the auto bailout, some people in Kokomo will not support her. And, maybe that's the lesson of these two cities. Economic investment — in Donald Trump or President Obama's case — isn't always enough to buy political goodwill.